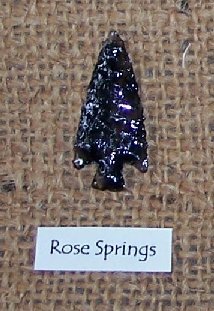 You can order one of many Specific Archaeological Arrowhead Type Replicas. 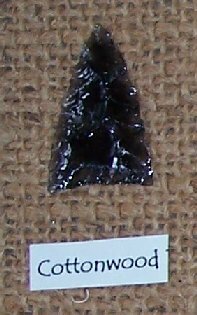 Below are just a few of the Named Arrowhead Types that Dr. Susan "Arizona" Gleason can replicate based on her studies, mainly Western American types out of Obsidian. Please remember that there is quite a wide variation even within a named point type, as well as in applied interpretation of these types. If there is a specific type that you don't see here, just REQUEST directly or by using the Special Request Order Form (PDF, 57KB). Small Side-Notched Point with Deep Notches and Large Rounded Base. Small Point with Serrated Edges and Short Stem with Strong Barbed Shoulders. Small Triangular Point with Strong Shoulder Barbs and a Short Expanding Stem. Small Ovoid Point with a Convex Base. Medium Corner-Notched Point with Shoulder Tangs and a Concave Broad Base. Medium Corner-Notched Point with Shoulder Tangs and Eared Base. Medium to Large Point with Contracted Base and Barbed Shoulders. 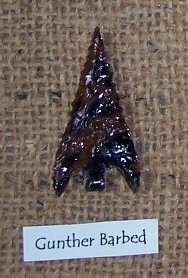 Small Broad Triangular Point with Long Barbs. 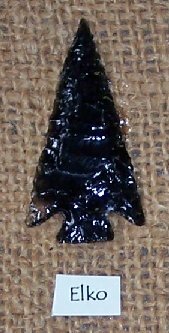 Small Lanceolate Barbed Point with Diamond Shaped Base. 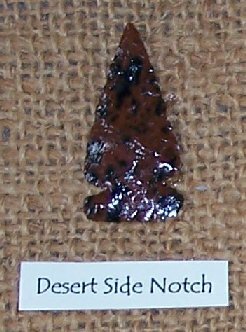 Medium to Large Side Notch Point wiht Concave Base. 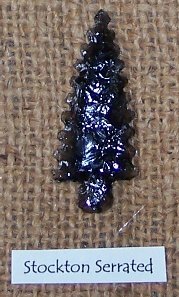 Medium Auriculate Point with Shoulders Barbed to Tapered and Base Deeply Bifurcated. Small Corner-Notched Expanding Stemmed Point. Medium to Large Point with Deep Square Serrations, Base Stemmed to Corner-Notched. A Small Side-Notched Point with a Straight to Concave Base. A Medium Sized Parallel to Contracting Stemmed Point. Basal Sides are Ground.